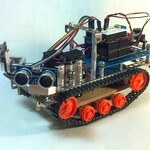 Stokes’ ProjBlog » My brain made me build a robot. One of the few books that has markedly affected the way I think is Vehicles: Experiments in Synthetic Psychology by cyberneticist Valentino Braitenberg. Half my life ago, I stumbled upon a copy in a used bookstore, and reading it was like getting a new pair of eyeglasses. In the book, Braitenberg describes a series of hypothetical robot ‘vehicles’ of increasing complexity. Most are simply one or more light sensors driving two wheels, but some simple arrangements produce what appear to be highly complex behaviors. I modeled my robot after the second or third vehicle he describes. In short: it has two range finders, one on each of the front corners, angled outwards by about 45 degrees. Each range finder controls the speed of the motor on the opposite side, so a shorter distance means a slower motor. That’s all. I built it with an Arduino, just because it was easy, but even that was overkill: were I an analog guy, the entire thing could have been built with just a comparator or something, no computing at all. // Range finder constants, pins and such. // when wiring everything up. // PWM pins used for the motors. // than the standard map() function. // Out-of-range distances sometimes come back as 0. // Not much to set up. Another flaw in version 1 is that moving through a narrow space slows it down. Version 2 (shown below) slightly changes things, making the motor speeds relative to the difference in distances detected, with one or the other always running at full speed. It makes things marginally more complex, but it’s still simple enough to implement entirely in analog, and not too much unlike some neuron behavior I only half-remember. Version 3 adds a forward-facing range finder, letting the bot detect if it has run headlong into something. If the forward range goes too low, it momentarily reverses and turns a small amount. It’s more complex on all counts (it requires an H-bridge to drive the motors both forwards and backwards), so it doesn’t have the same conceptual purity. It did, however, get its picture in the Boston Globe!